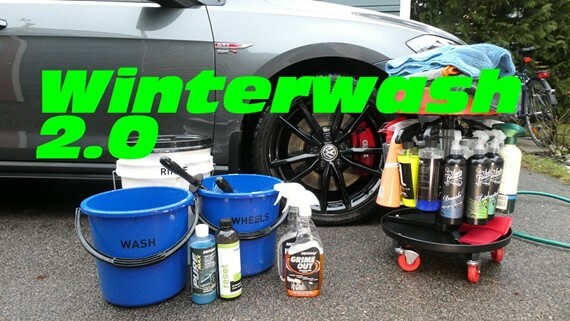 Tools and Products for a fast and safe Winterwash. The Products in this Movie is really awesome! , but the most important is to use Premium products. It´s more safe and fun!. And in the long run it is not so much more expensive.. Optional Big Brush for inside of the wheel. EZ Details , Wheel Wollies e.g. Iron fall out, or Wheel cleaner. As the Britemax Fall out, Tershine Relive e.g. Degreaser as Britemax Grime out, Tershine Extract e.g. Optional Quick Coat ( to protect from salt e.g. ) Britemax Spray and Shine, Tershine Refract, Auto Finesse Finale e.g. 2 Wash mitts One for upper part and one on the dirtiest lower part. 1 Used och cheap microfiber towel for door sills e.g. Optional some kind of blower to the grill and tight places. But i use many more things on a proper summerwash. As Glas cleaner, Trim and tire dressing e.g. Or you go to the "Scratch my car" Automated Carwash!